One year after the spectacle with which the Four Horsemen finished their show and took their ultimate revenge on baddie Arthur Tressler (Michael Caine) they've disappeared from the public eye. Jack (Dave Franco) is presumed dead; Atlas (Jesse Eisenberg) is consumed by the organisation that brought them all together, The Eye; Merritt (Woody Harrelson) is working with Jake on sharing their respective specialties; Henley (Isla Fisler) has left the team; and Duncan (Mark Ruffalo) is still working for the FBI, supposedly tracking the whereabouts of the Four Horsemen. Just like with the first film the strength lies within the incredible illusions and the way they've been edited slickly together (with a heavy dose of special effects, mind). With the epic score rolling underneath it, it has audiences in the cinema just as much in awe as those at a magic spectacle in Vegas. And in contrary to a real-life illusion, the characters actually narrate the tricks and allow their audience a glimpse behind the magic curtain, which is always an added bonus for anyone as curious as me. While I would happily watch a two-hour long show that comprises of The Four Horsemen performing one awe-inspiring illusion after another, the film has a decent story too, both the mystery surrounding The Eye and this film's baddie, as well as a glimpse into Dylan's father disappearance. While these storylines weren't explored to their fullest, as the biggest draw is without a doubt the spectacular heist sequences, it did add another layer to what so easily could've become another brainless popcorn flick. And the cast! All-star names aside the chemistry sizzled off the screen and the different characteristics created a very exciting backdrop to the magic and trickery. When Jesse Eisenberg rose to fame through The Social Network it was hard to imagine him playing someone cool, but man when the Horseman come together on stage to show off their incredible skills they are the epitome of cool. And that is exactly what this film is too; a slick and shiny display of illusions of epic proportions that makes magic look far more interesting than predictable party tricks. While expectations were very high after the jaw-dropping finale to their show in the first film, The Four Horsemen are back with a whole slew of new cards up their sleeves in Now You See Me 2. Yes, even card tricks have been elevated to the next level in this sequel. So if you want to get your mind blown (or you just really, really like Dave Franco) get yourself to the cinema for two hours of fast-paced fun and incredible illusions. 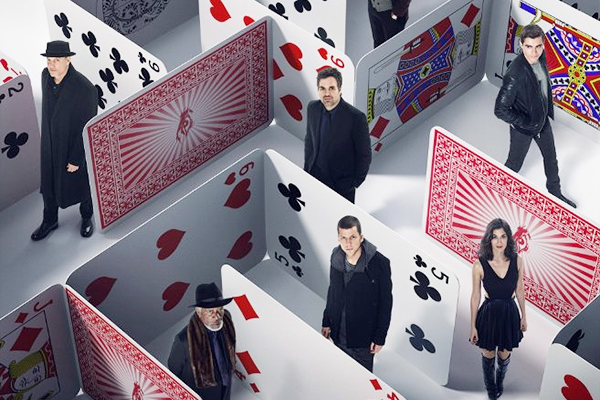 Now You See Me 2 opens in cinemas across the UK on 4 July 2016. But I'm a bit disappointed that Isla Fisler is not part of the cast anymore, as I really like her. How was Lizzy Caplan's performance?